One of the many Swedish settlements in Nebraska during the late nineteenth century was north of Gothenburg in northwestern Dawson County. An enduring symbol of this settlement is Swedish Crosses Cemetery, where three children of Mr. and Mrs. Berg are buried. These unique grave markers were made in a traditional Swedish style between 1885 and 1889 by the children's grandfather, Benjamin Palm. Mr. Palm was the first blacksmith in Gothenburg. 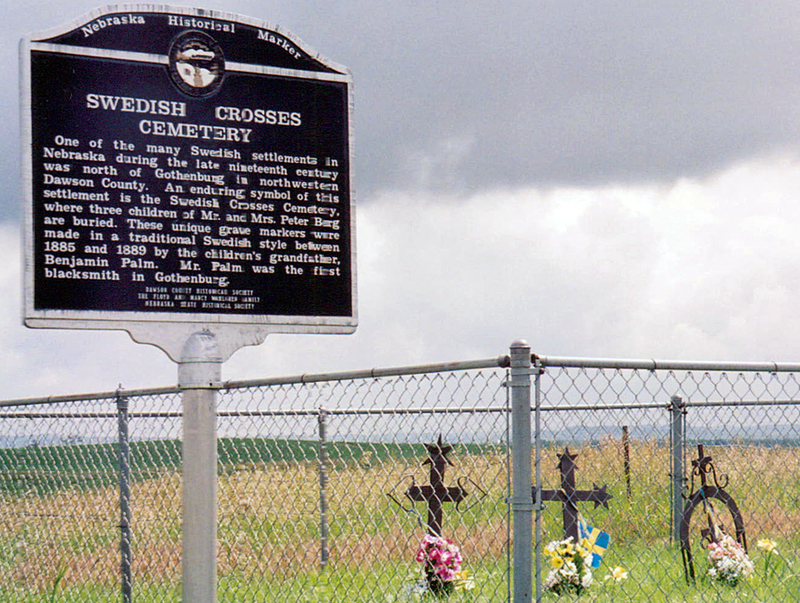 “Swedish Crosses Cemetery,” Explore Nebraska History, accessed April 18, 2019, https://mynehistory.com/items/show/143.